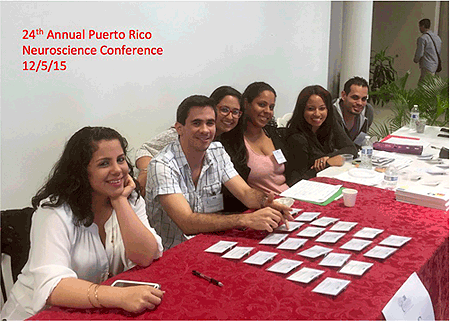 Institute of Neurobiology students participated in the organization and coordination of the 24th Annual Puerto Rico Neuroscience meeting, December 5, 2015. Visiting speakers included Dr. Eric Nestler (Mount Sinai School of Medicine), Dr. Eric Newman (University of Minnesota), Dr. Ricardo Zayas (San Diego State), and Dr. Elisabeth van Bockstaele (Drexel University). The meeting attracted more than 300 participants and the program included more than 70 posters (see http://neuropr.rcm.upr.edu). Thanks to Dr. Jennifer Barreto (UPR School of Medicine) and all of the meeting organizers.